Since purchasing the Ekati mine in 2013, Dominion has been working hard to modify procedures, improve organic waste management awareness across site, and invest in innovative technologies to reduce waste, fuel, and water consumption. For preservation of the environment and focus on sustainable development, Dominion received the Environmental Excellence Award from the Northwest Territories and Nunavut Association of Professional Engineers and Geoscientists (NAPEG). The award was presented to Dominion for the organic waste management process at the Ekati mine, which includes an industrial scale composter, along with incineration, landfill, and hazardous waste management practices. Dominion also received the Environmental Excellence Award from Towards Sustainable Mining in recognition of the company’s comprehensive waste management program at the Ekati mine. Dominion has received recognition for being the first northern mine to compost a significant portion of waste through its industrial composting unit, which was brought online in 2015. Today, over half of the organic waste at the Ekati mine is composted. Dominion introduced road ‘trains’ at the Ekati mine for ore haulage, reducing fuel consumption, improving efficiency, and reducing emissions. A road train consists of one engine unit towing multiple trailers to haul larger amounts ore by road. To reduce operator fatigue risk, Dominion introduced camera-based, non-contact, non-intrusive sensor to observe drivers. The system works with glasses, including most sunglasses, and measures head orientation, eyelid closure, and GPS location to monitor fatigue events, provides audio warnings and seat stimulation, provide video feedback, map the face, and measure pupil/eye/head movement. In 2015, Dominion Ekati mine’s underground production changed to depend solely on tele-remote operation. As a result, the scoop fleet tele-remote operation was relocated, and surface-based remotes now control the underground mining scoops. Dominion is implementing projects that reduce diesel fuel use, and by extension, greenhouse gas emissions. Examples include installation of a new state-of-the-art waste incinerator in 2015 that significantly reduces emissions and installation of low-power high-intensity LED lighting in all maintenance facilities, which is being extended to the main accommodation and process plant, as well as to exterior lights. 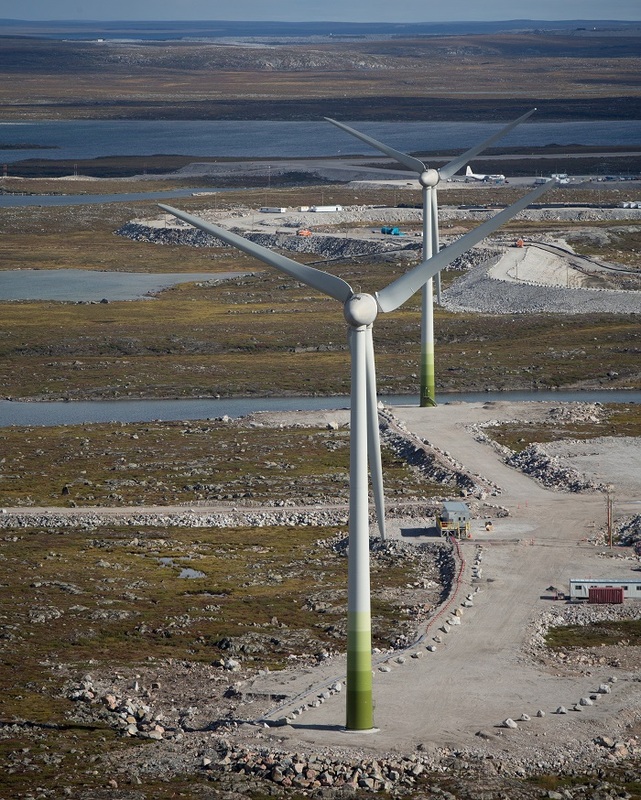 Diavik operates the NWT’s only large-scale wind farm and the world’s largest wind-diesel hybrid power facility. Funded by the joint venture partners, the four 9.2-megawatt turbine wind farm is operational to -40°C. It began delivering power to the mine’s grid in September 2012. In 2017, it provided 9.2 percent of the mine’s power needs. This reduced the mine’s 2017 diesel fuel requirement by 4.2 million litres, an estimated reduction in emissions of 10.5 tonnes of CO2, and a reduction of Diavik’s seasonal winter road fuel haul by about 80 loads. Since 2012, diesel offset is 22.1 million litres. Payback on the mine’s $31 million investment is estimated at six years. The extreme location of the mine meant a highly innovative design was needed for the turbines; one which also included adjustments made during the first several months of operations. To eliminate frost accumulation Diavik adapted the blade heating system with de-icing technology and retrofitted the bases with heating. As well, powerhouse operators monitor wind variations as this is important to assist in achieving optimum results. At Gahcho Kué, the ground-breaking Ni Hadi Xa (NHX) collaborative environmental monitoring group was active throughout 2016. This program includes five Indigenous communities who work together with staff to review environmental monitoring. A NHX monitor works alongside Gahcho Kué’s environment team on site. In addition, a cabin was built nearby to provide a base for two traditional monitors who will spend at least 12 weeks a year on the land. The cabin will also host a family visit program. In September 2016, Gahcho Kué hosted its first fish-tasting event. Elders from all local communities participated, sampling fish caught in Lake N11. Over the years, De Beers has supported dozens of environmental study programs, including over 25 peer-reviewed papers on the Snap Lake mine aquatic ecosystem. One of the most recent programs at Gahcho Kué involved a two-year program to study the impact of Gahcho Kué construction on downstream grayling. The 2014/15 study was done in collaboration with the University of Waterloo and it included monitoring fish activity. This involved implanting radio tracking devices in fish and using radio frequency sensors placed throughout the downstream watershed. The study showed that the Grayling continued to inhabit waters close to the mine and were thriving in waters about 10 kilometres downstream from the mine. Gahcho Kué Mine has a business improvement program working to develop several initiatives that will improve operational costs and energy efficiencies. This includes installation of a heat recovery system to heat to many buildings at the mine, driving significant energy savings and reducing greenhouse gas emissions. In addition, there was an active program to install LED lighting across the mine. Other initiatives, planned for implementation at Gahcho Kué in 2017 and 2018, include expanding the glycol heating system and implementing a composting system for organic waste. De Beers is also planning to establish a rock testing lab to expedite identification of mine rock with higher sulphur content. This is expected to significantly reduce the amount of rock needing special handling and this lab will eliminate the need to ship samples to British Columbia for testing.